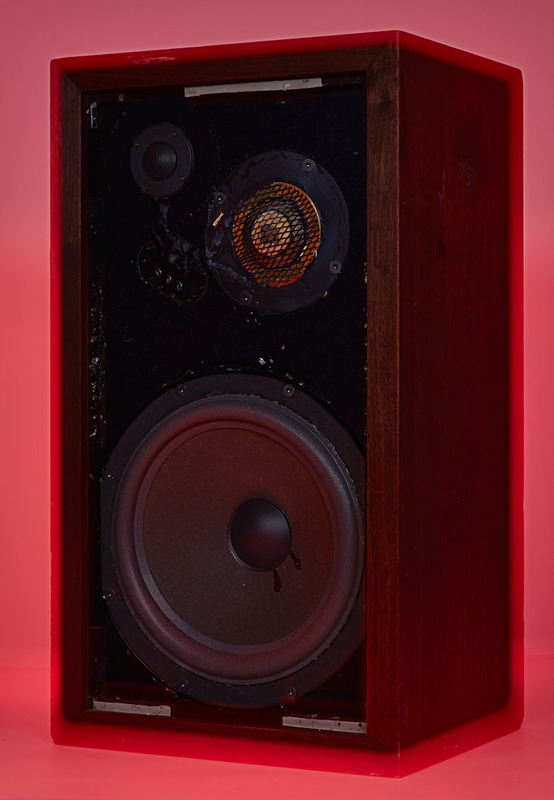 The series is about devices / gears that came to the market for their high acoustic quality, design and function for a small and very wealthy audience. For most of us, these gears were too expensive, so they are titled "Daydreaming Gears". 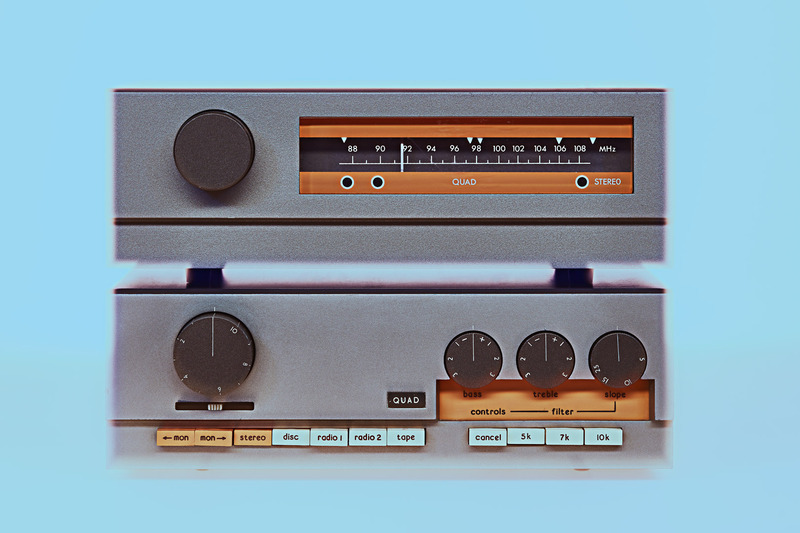 The first high-quality devices are developed in the post-war period in the mid-1950s and claim that the listener can not distinguish between a concert and a device. 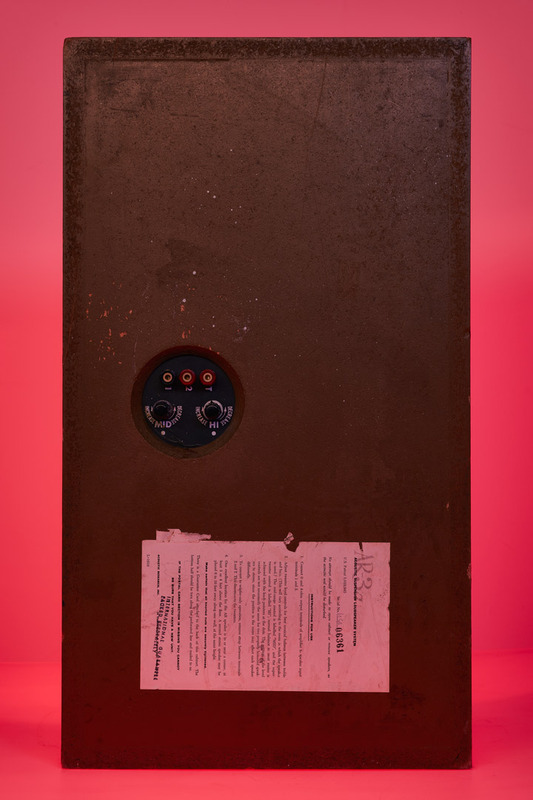 The American loudspeaker manufacturer Acoustic Research launched the first acoustically high-quality closed box AR1 in 1954 and the legendary AR3 in 1958, which set standards for the long-standing market and was the reference box for the many emerging loudspeaker manufacturers. 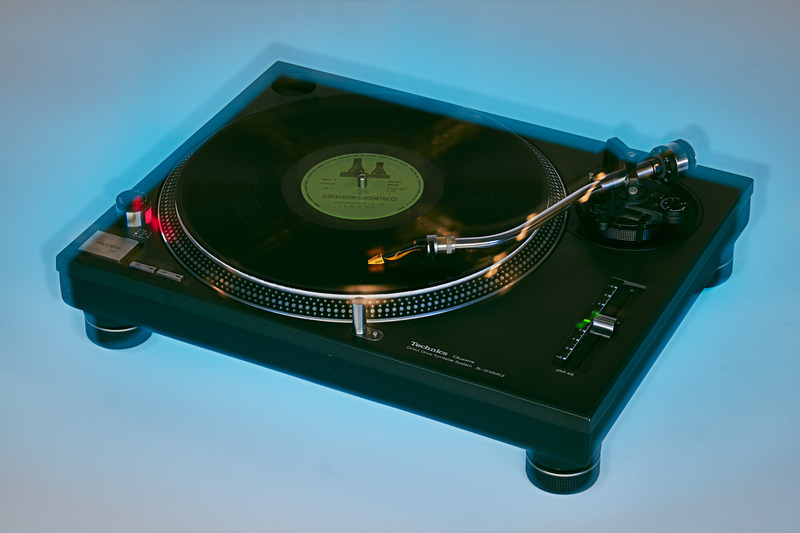 While the radio conquered the living room from the 1920s onwards, and the development of technology began, in the end of the 1940s, the vinyl record began to dissolve the shellac. Vinyl, a recording medium that can reproduce the insensitive and high technical recording standards of the radio stations and music studios. This high standard also reaches the living room. 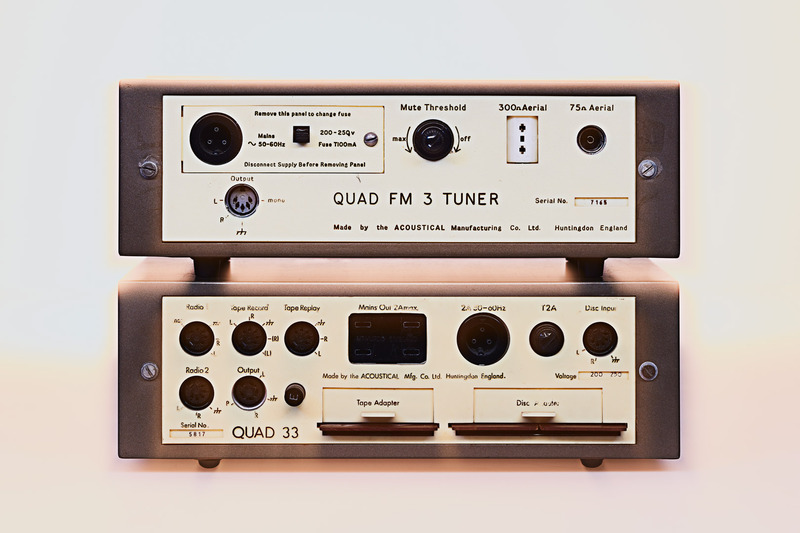 In 1950 the English company Quad launched the Quad I, a tubular mono- amplifier (15Watt) (the legendary Quad II from 1953). 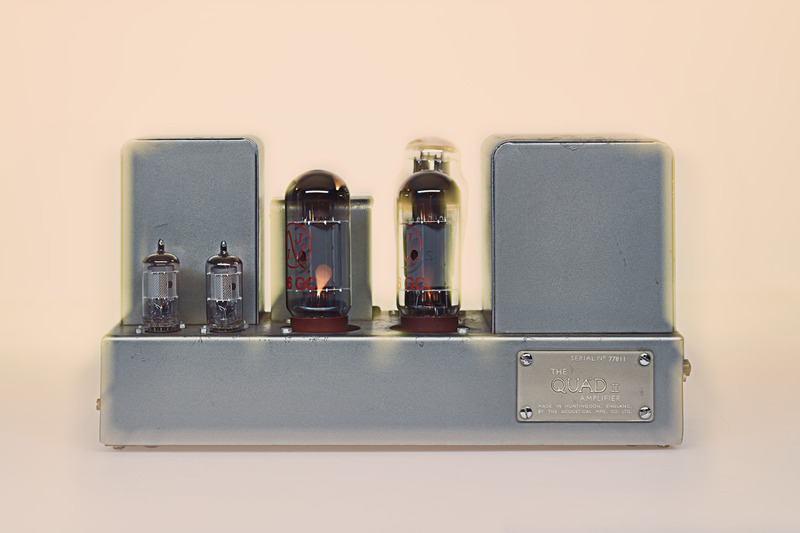 This preamplifier / power amplifier combination with the associated radio receiver and the famous Quad electrostats can be called the first reference music system, which stands for the emerging post-war HIFI boom. 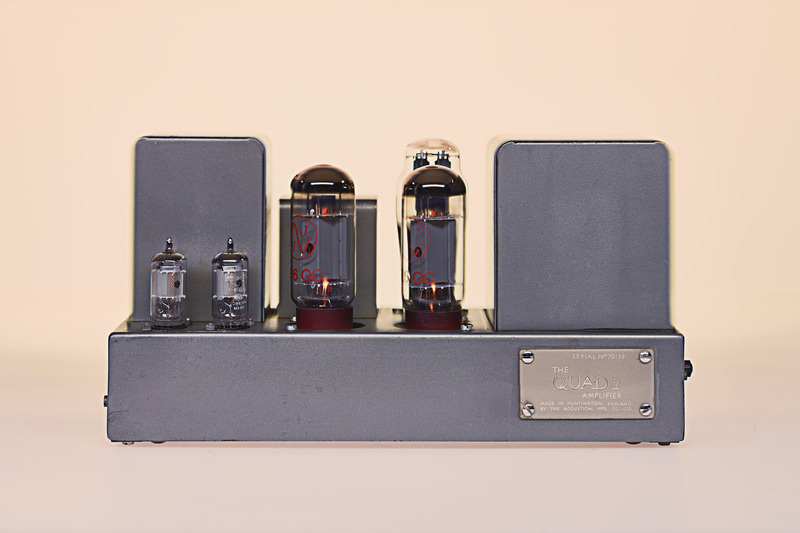 To this, the preamplifier Quad 22 has a phono input, which allows the playing of turntables. The medium vinyl record opens up an unimagined market. 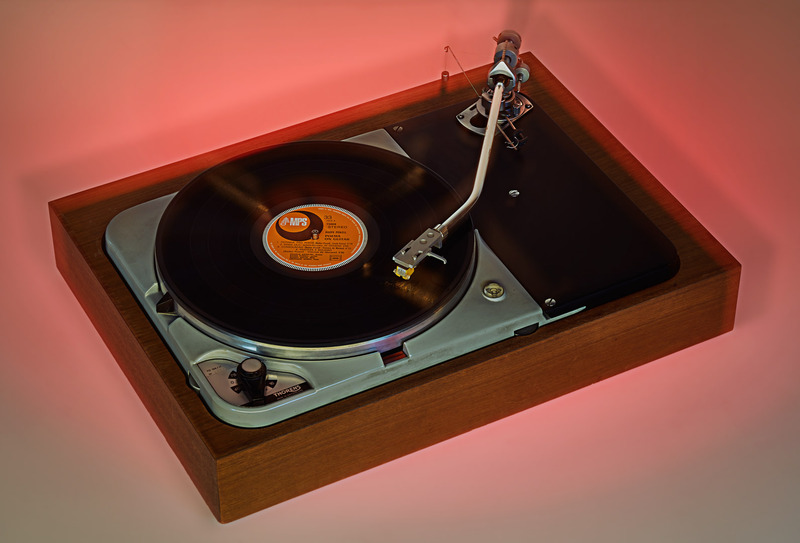 "In 1957, a year before the introduction of the stereo record, the Thorens TD 124 was a high-quality record player for professional use in radio stations, one of the first to replace a changeable tone arm (patent CH343667) Up to 12 inches). "(Wikipedia). Shortly thereafter, he successfully enters the market. 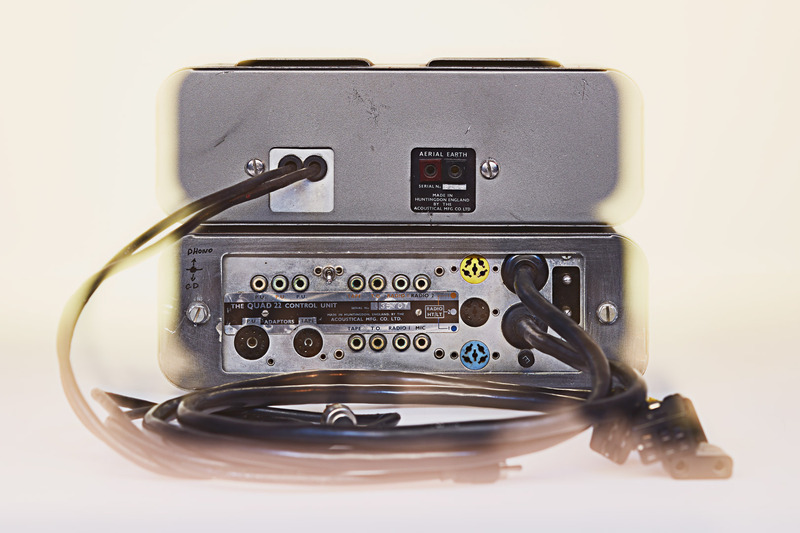 The precision bearings and plates manufactured in Switzerland for the TD 124 are still unmatched today. In conjunction with the legendary 12 inch Tonearm Shure SME12, the TD 124 is still one of the best players. 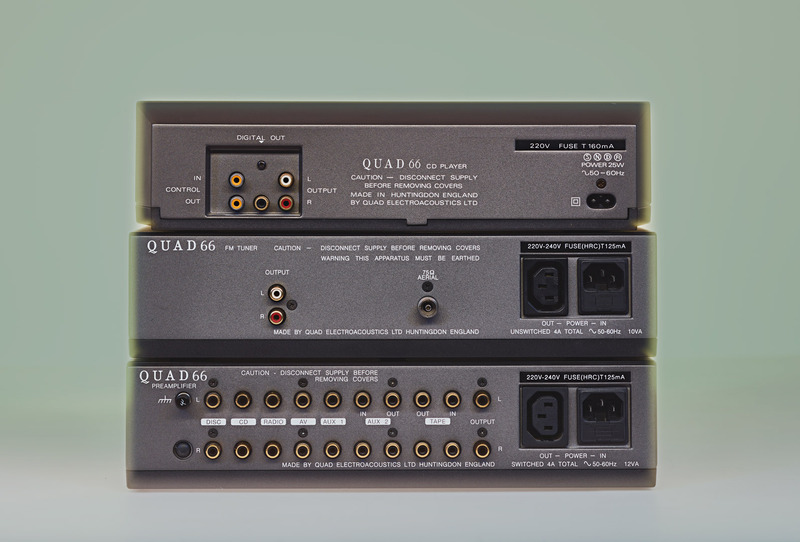 The Quad-pre-amplifier series – Quad 22, Quad 33, Quad 66 – with front and rear view show the technical and historical development of the 50s, 60s and 80s / with the advent of the CD player (1982 launch of the audio CD) and the evolution of connections and design. In a few years, the CD replaces the vinyl record as the best selling audio media. 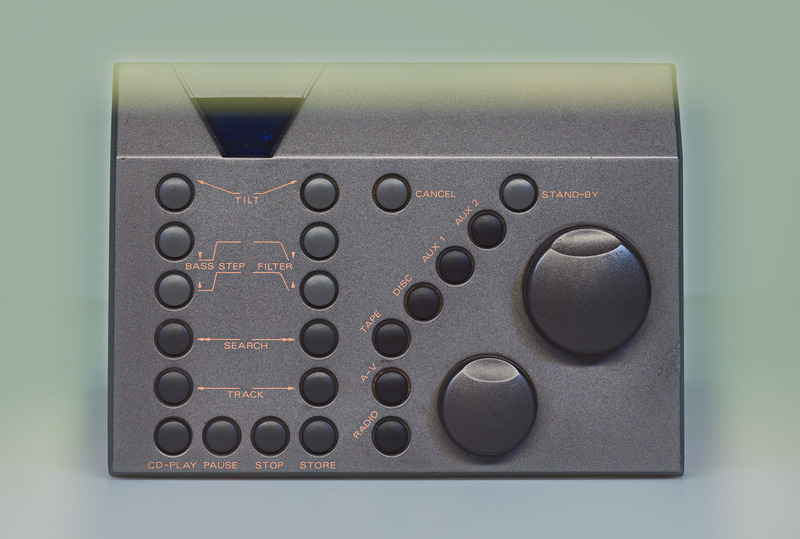 Note the corresponding remote controller on the Quad 66. 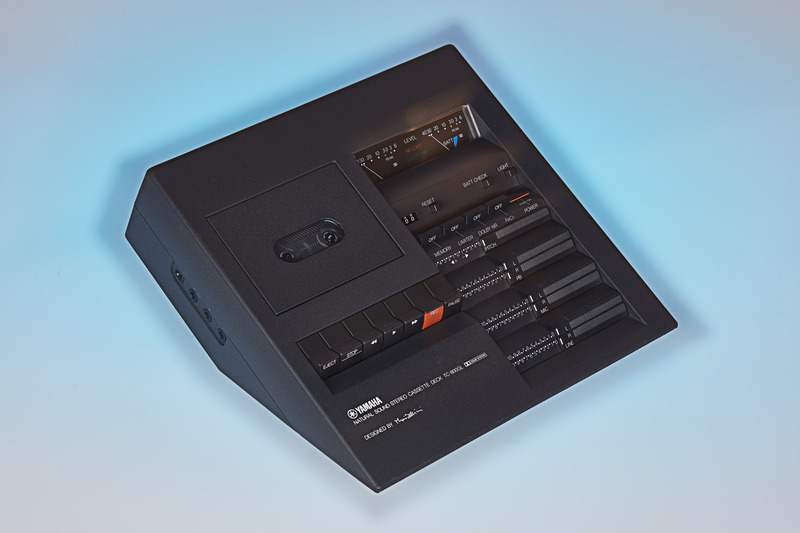 The music cassette (MC) appears as early as 1963 and becomes one of the most widely used audio media between the early 1970s and the late 1990s. 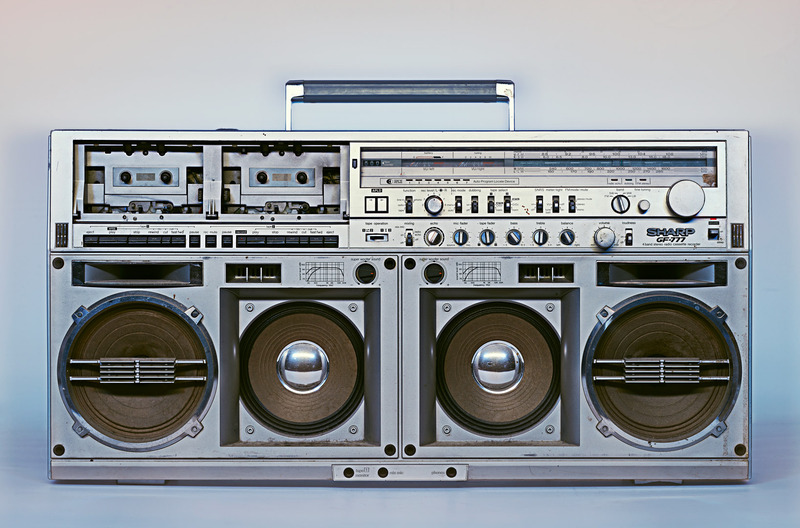 The playing and recording of the cassettes gained a high popularity with the first mobile recorders and solved the static living room system. 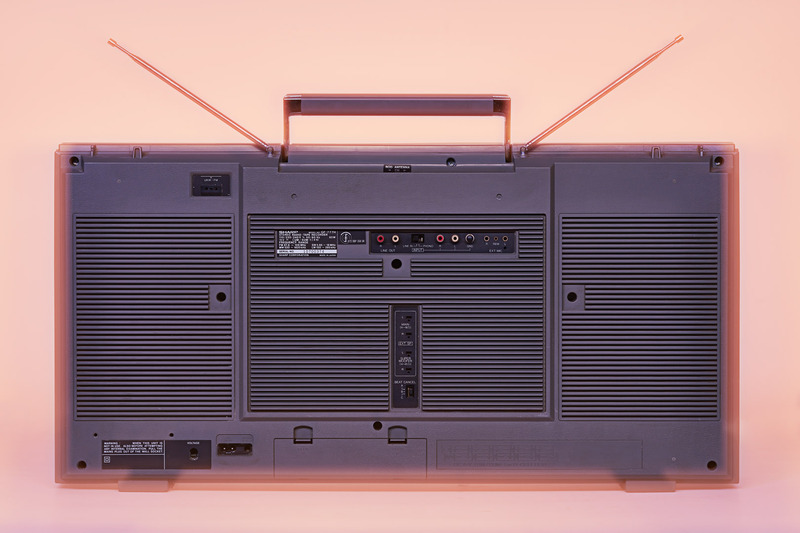 The recorder Sharp GF 777 represents the well-known Boombox of the end of the 70s / 80s and for the shift of the music and youth culture on the street. It works with ten batteries and also has a phono connector on the back. 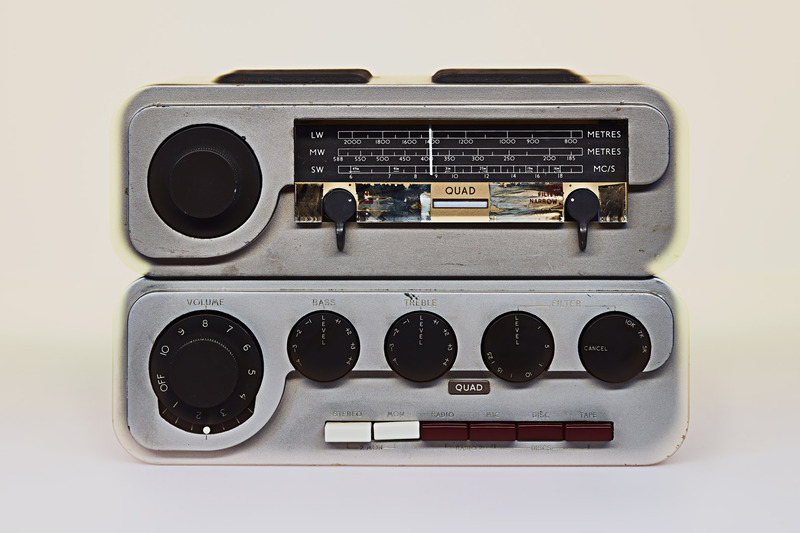 The owner found the first device at a flea market and was so enthusiastic that he was able to get a second. 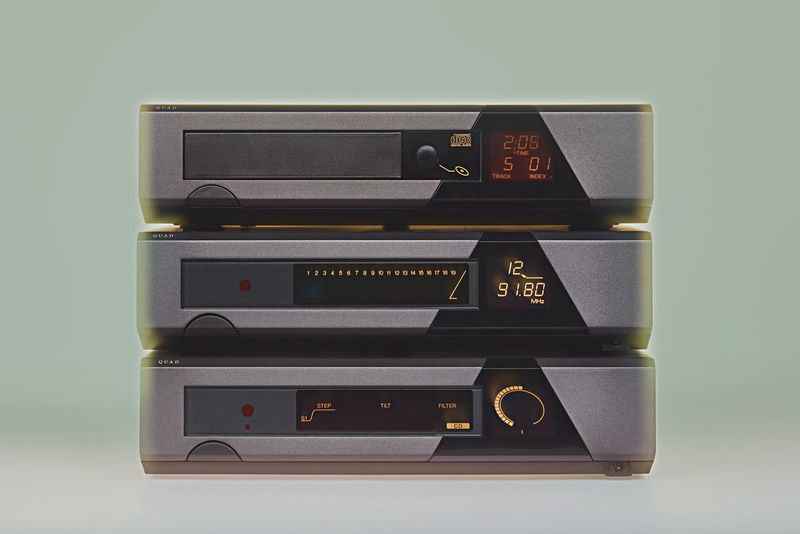 The 'Bellini' cassette recorder Yamaha TC800 GL belongs also to a flea market discovery, it is also one of the mobile recorders of the 80s, but the opposite of the Sharp Boombox another target audience. 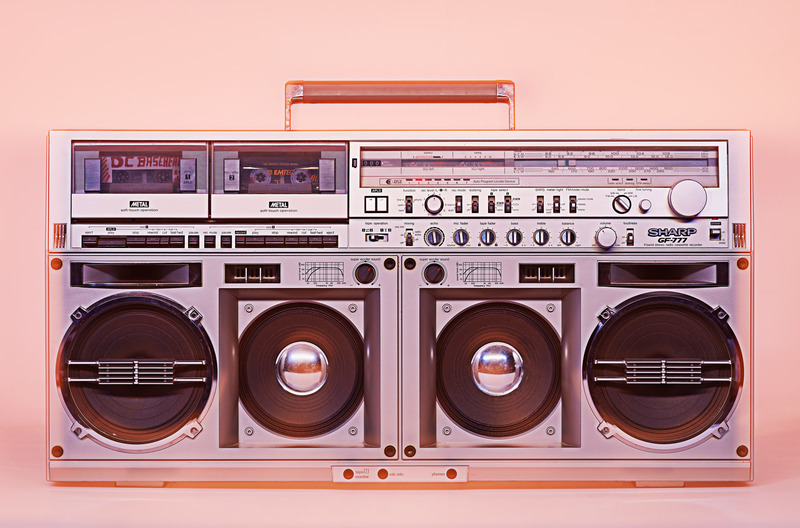 The musical success story of the last hundred years, whether radio, record, cassette / tape / recorder / walkman, CD / mobile CD player, the iPod / mp3 and now smartphone / digital streamings, all these devices and media were first for a small and rich circle and then opened up quickly to the general public. 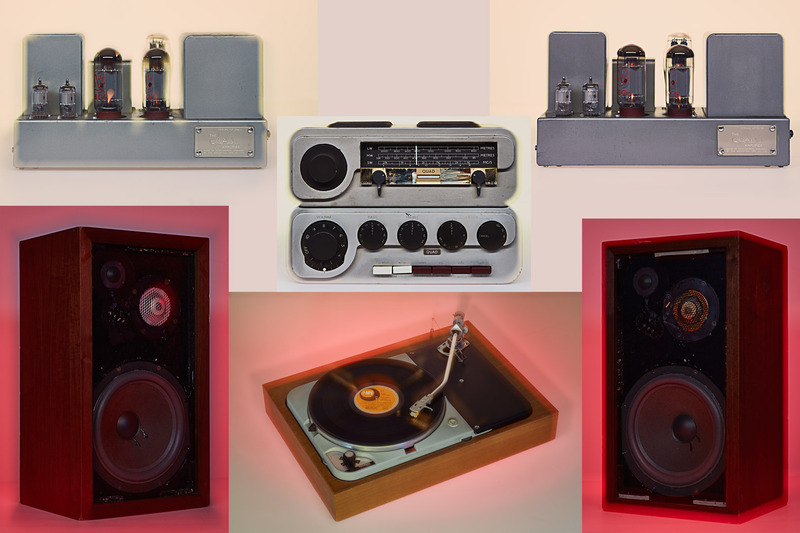 Fascinating that this early devices of the 1950s, today have set standards that are acoustically superior to the mp3 and all streaming services. None of the illustrated devices (except the 1210) are in my possession. I would like to thank my friends who have made these devices available. The series is continued with additional devices. 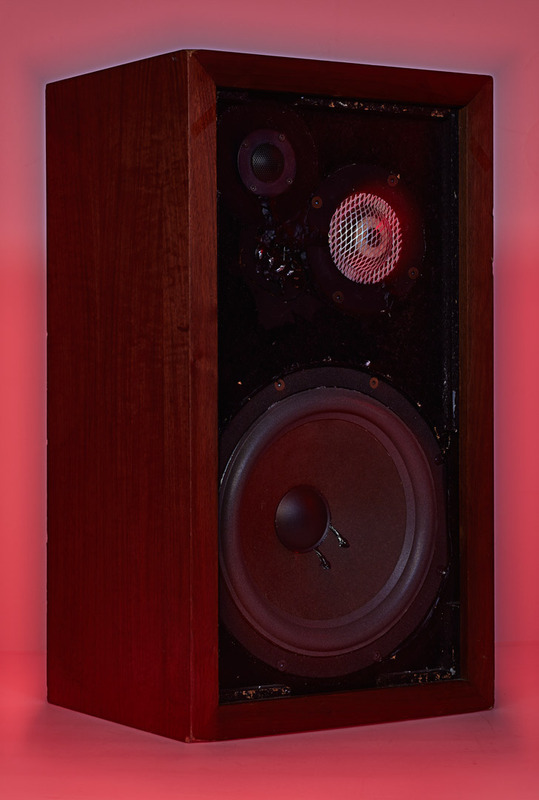 Most Quads and AR3a loudspeakers are still in use today.